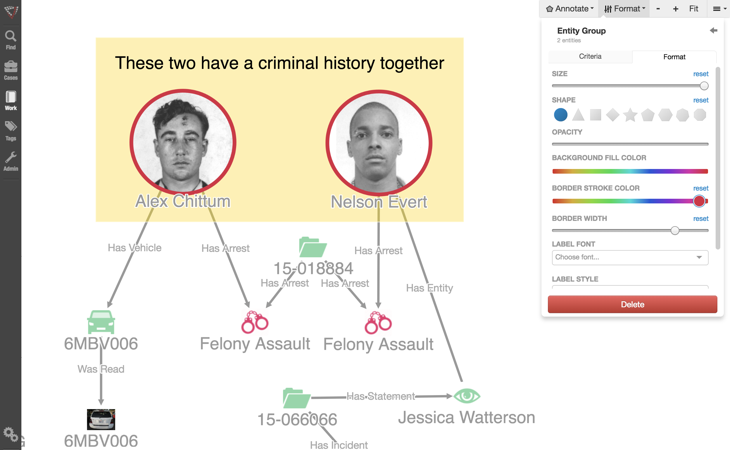 Link analysis is at the heart of any investigative analytics platform. The ability to easily visualize graphs of interconnected entities (e.g. people, organizations, locations) is critical to solving complex cases. 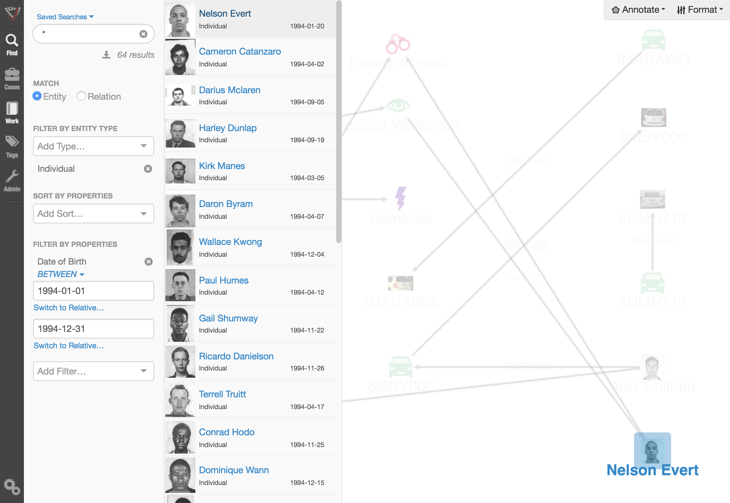 Without it, analysts are often left to keep intricate webs of connections in their head or document them in spreadsheets or documents. Even the best analysts are likely to miss important connections, leading to incomplete analysis and unsolved cases. In this post I’ll describe how Visallo approaches link analysis. Simply providing a means to visualize a network graph of related entities is important, but challenges quickly materialize as networks become large and complex. That’s why it’s important for investigative analytics platforms to provide the following four capabilities to enable effective link analysis in the face of overwhelming amounts of information. When network graphs get large and busy, understanding how entities are connected becomes a challenge. Most investigative analytics platforms will provide the ability to automatically layout entities in a variety of predefined orientations. These automatic layouts provide a quick and easy method to organize large graphs in a logical way, making it easier to find the most important entities. With Visallo, you can quickly organize data through a rich set of layout options and find connections within data that you didn’t even know existed. Our out-of-the-box layout algorithms automatically arrange your graphs in several different formats to quickly simplify the visual presentation, making complex graphs easy to understand. You can always manually arrange things on your graph too. Network graphs can quickly grow difficult to understand, even for the person creating them. So just imagine how hard it is for an outsider to understand them without some additional context or clues. A good investigative analytics platform will recognize this challenge and include tools to help you mitigate it. For example, size and color are great attributes to adjust for isolating and calling attention to important entities on a graph. With Visallo, you can adjust size, shape, opacity, fill color, border color, border width, label font, label weight, and label color by selecting elements manually or establishing conditional criteria that can be applied across an entire graph. Done well, this can make even the most complicated graphs simple to understand. With Visallo, you can also add annotations of various shapes to your graphs, change their opacity, background color, border size, border color, etc. And of course you can add text labels too. These are great options for isolating and calling attention to critical elements of your link analysis. Finding a given entity becomes very difficult when your graph is large. Visallo’s target highlighting is a feature embedded into each item of a list in Visallo to address just such a problem. 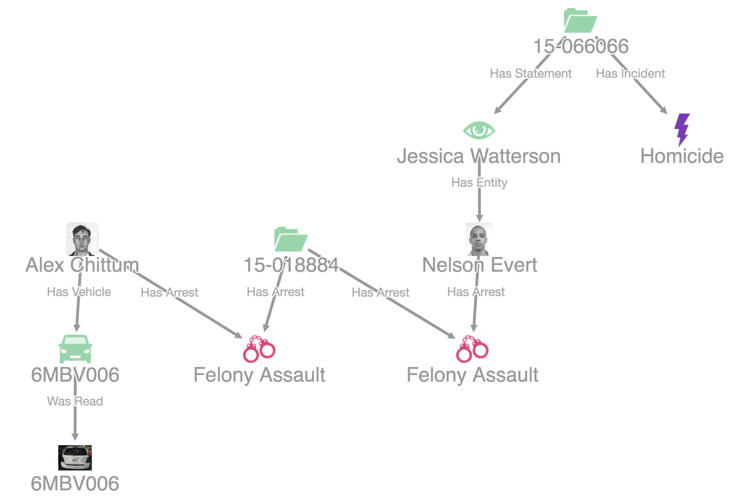 Examples of such lists include search results, lists of tagged items, and lists created by selecting multiple elements on a graph or map. Hovering over any item in these lists will cause your graph to highlight the corresponding element, making it easy to find specific things on the largest of graphs. 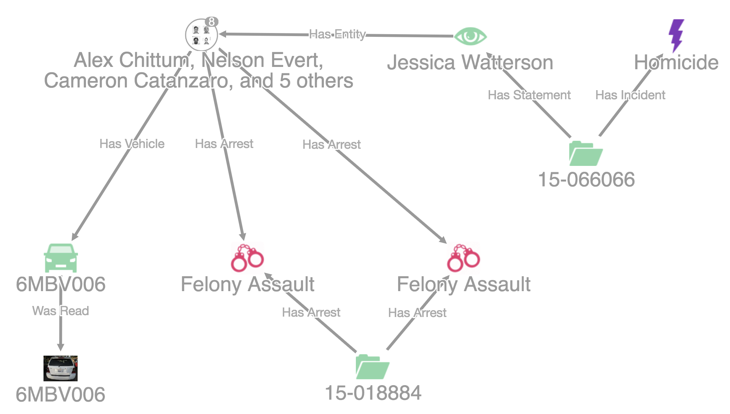 To deal with the complexity of overcrowded graphs, an investigative analytics platform like Visallo allows you to collapse a selection of entities into a single node. For example, you could collapse all members of a specific gang into a single element on the graph, greatly reducing the visual noise without losing context or missing important relationships. Link analysis in the real world is often far more complicated than it sounds, with most of the difficulty revealing itself at scale. While the four features described in this post are not an exhaustive list for making your link analysis more productive, living without them is difficult. You should expect at least this much from your investigative analytics product, Visallo or otherwise.